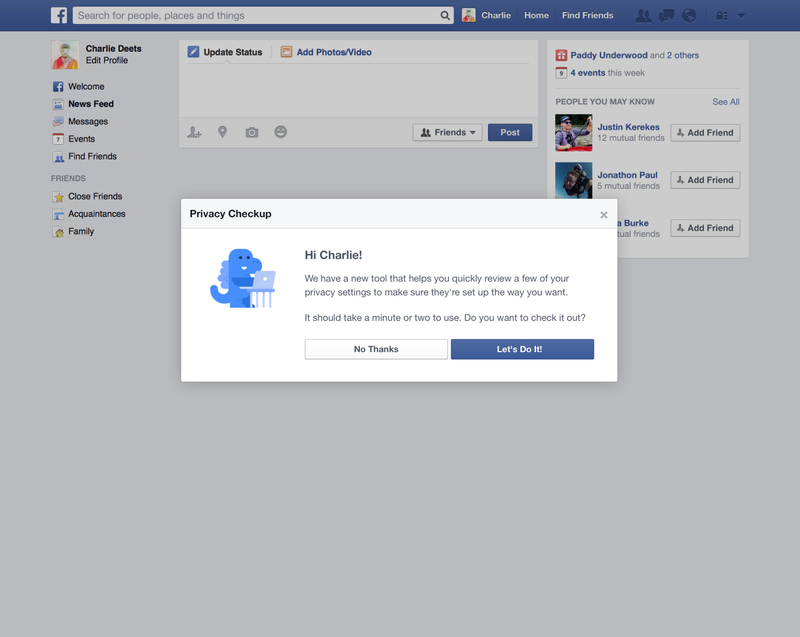 Facebook has rolled out its long-awaited privacy “checkup” button. The checkup is exactly what it sounds like — a way to quickly scan your activity on the site and see who can view it. If you choose to run the checkup, the system will walk you through who can see your posts, which apps you’ve tied to Facebook, whether those apps are public, and what parts of your personal profile are public. Underwood told Re/Code that this is the first time in the company’s history it has prompted users to review the privacy settings on their app permissions and profile details. There’s an irony, of course, in the fact that Facebook’s privacy settings are so buried and confusing that the company has to task a cartoon dinosaur — dubbed Zuckasaurus by the New York Times — with teaching you what you’ve shared to which audiences. I’m not sure anyone would task the company with being your go-to doctor on privacy health, but the tool is helpful in navigating its feature jungle. I have a deep aversion of doctors … for I find theny tend to dig up more than you want to cope with. Why make life difficult for the self .. so much work in trying to play a blame game with others on fb. Just sit back .. tell yourself .. life is good, people are good .. we all need people to interact with. Who knows that the person you think bad today may turn out to be a good friend tomorrow. Live and let live.